Looking to purchase a KIP 7100 wide-format multifunction printer at the best bargain? Excellent, that means you are in the right place! Arizona Copiers has the widest selection of superior-quality KIP models in the industry. Whatever configuration you need, we will work with you to find the best solution available at the most discounted princes to fit your business’ budget. At Arizona Copier, we place a top priority on customer satisfaction, so we are not content unless you are completely satisfied with your purchase experience. We work hard to ensure this happens, especially with our exceptional customer service and speedy delivery anywhere in our expansive service area in the Valley of the Sun metropolitan area. Feel free to contact us today at 602-428-5885 to receive a quote for buying, renting, or leasing your new printer. 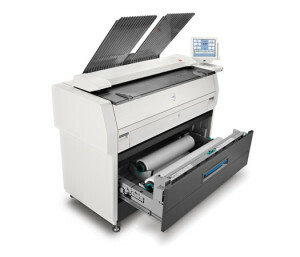 The KIP 7100 offers the ultimate in multifunction performance for superior printing, copying, and scanning. This KIP model delivers fast and accurate copies at up to 6 “D” size prints every minute, with a high 600×600 dpi print resolution for sharp and crisp detail. The printer provides four different stacking configurations for flexible output options to suit all of your needs for wide-format printing. In addition to incredible monochrome capabilities, the KIP color advanced software offers your business the ability to print, scan, and copy in every color of the rainbow too. It is perfect for businesses that are seeking to complete top-notch posters, signs, and other large business projects. The auto stacker feature can even automatically print and stack or fold the documents as chosen. When you purchase the KIP 7100 from Arizona Copier, you will acquire one of the most easy to use printers in the industry. The on-board touch screen offers high-definition color display to control a wealth of options at the touch of a finger. With its simple navigation commands, you can view, scale, organize, and print file sets in a breeze. The KIP model is outfitted with both PC and web-based viewing and printing capability. Furthermore, the integrated USB port allows your business to view and print documents that are stored on the device instantly for a streamlined workflow. With its flexible output and reliable performance, this wide-format printer will help to make your workload easier and up your output dramatically. Get Your Own KIP 7100 Today! Our company possesses the greatest expertise in the copier industry and takes pride in carrying all of the best copying products on the market for our loyal customers. We are more than just a company that sells, rents, and leases copiers; we specialize in helping businesses provide solutions to increase their productivity and boost their growth. At Arizona Copier, you are guaranteed to receive the best bargains and the most value for your investment with protection from our leading industry warranties. Call us today at 602-428-5885 to speak with one of our friendly and considerate sales representatives that are eager to help you obtain your own KIP 7100 immediately!